Liverpool can close in on a place in next season’s top four if they reproduce the form they showed in the second half of the previous campaign, skipper Steven Gerrard has said. Gerrard, 32, said Brendan Rodgers’ team had shown signs of being able to break into the Champions League places as they lost only one of their final 12 matches of the 2012-13 season. That, however, was only enough for them to finish in seventh place after an inconsistent first six months in charge for Rodgers. 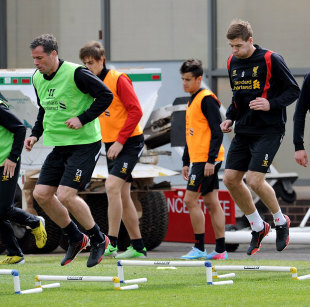 But with the manager continuing to reshape his squad in the summer, Gerrard said he was confident the Merseysiders could now aim higher. “The final five or six months of the season were fantastic – I think it was top-four form,” he told the club’s official website. “We certainly finished the season really strongly, but we were very inconsistent from August to Christmas. That’s the reason we never managed to achieve what we set out to do, which was a top-four finish. He said that if the Liverpool fans “get behind us and show the support that we know they can, I believe we can push into the top four”. But he said that would only happen if the players could cut out the sort of off-days that saw them slump to some unexpected heavy defeats. “There were certain games where we weren’t happy with ourselves individually and as a team – Southampton away, Aston Villa at home, West Brom away,” he explained. Meanwhile, Liverpool midfielder Jay Spearing is poised to move to Championship Blackburn Rovers in a £1.5million deal, the Daily Mirror reports.